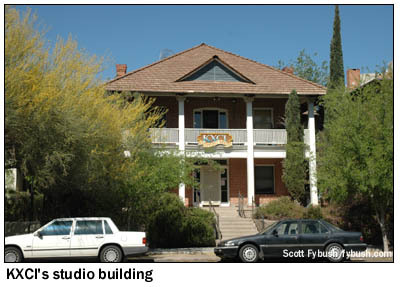 Our second day in Tucson back in April 2009 started off bright and early with our one and only studio visit in town: the lone broadcast facility anywhere near downtown Tucson, the big brick house at 220 South Fourth Avenue that's home to funky community station KXCI (91.3). 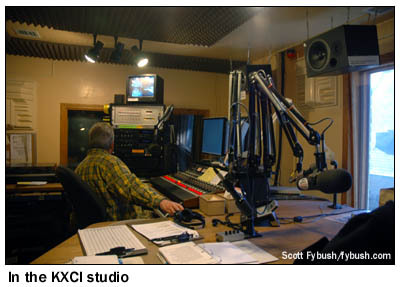 The calls spell out "91" in Roman numerals, and the programming on KXCI is eclectic, with a strong AAA lean. There's a production studio and offices downstairs, and up the big Victorian staircase we find the main air studio, a nicely-appointed (and big!) room surrounded by record and CD library space. 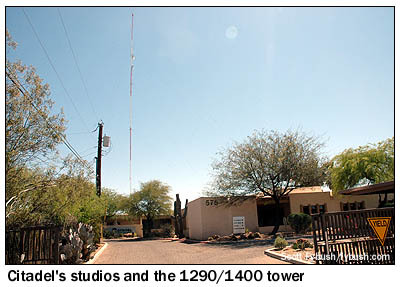 There's more radio in this neighborhood, too: off N. 1st Avenue just north of Grant, we find the tower of Tucson's daytimer on 690; it was KVOI when we were there in 2009, but later on it swapped calls and formats with KCEE, then on 1030. 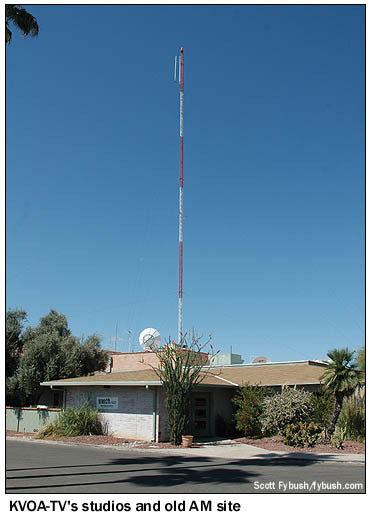 And moving east on Grant, we find a short tower behind a car wash just east of Country Club Road - this is KFFN (1490), part of the Journal cluster, and the descendant of the "new" station, KAIR, that signed on at 1490 in the 1950s after the original Tucson 1490, KTKT, moved down the dial to 990. 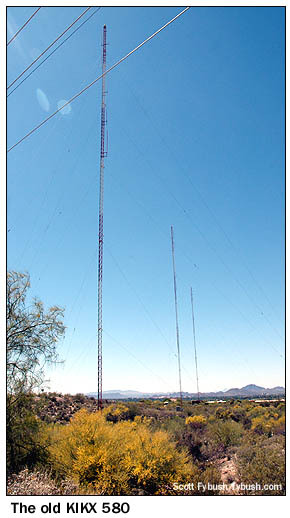 The ritzier parts of Tucson spread north and east from here, off into the hills, and it's a short drive east on Grant and north on Swan Road to one of Tucson's most intriguing sites: a three-tower array that looks like it should belong to an AM station, even though there's no AM station here, just a slew of two-way radio antennas. There's a long, complex history behind this one: the station that was here began life in 1947 as KCNA on 1340. It was located right in the city back then, at 16th and Cherry, but in 1951 it moved down the dial to 580, up in power to 5,000 watts and way out of town to what was then the very remote "Swan Road Extension" up here. 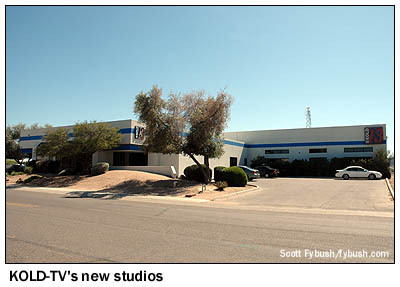 The station was later known as KTAN, but it found its greatest success as KIKX after being purchased by John Walton Jr. in the mid-sixties to replace his daytimer, 50-kilowatt KFIF (1550). 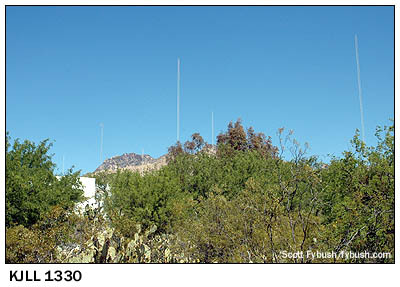 Even deeper in the northeast Tucson hills, in a residential neighborhood off Sunrise Drive, is the array of KJLL (1330 South Tucson) - but its six unpainted towers are so skinny and so deeply tucked into the terrain that they're all but impossible to photograph clearly. 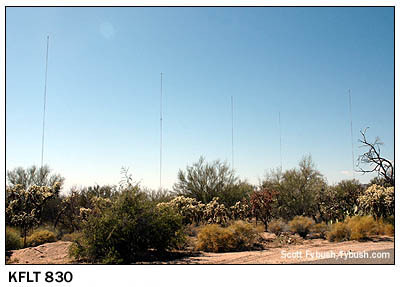 Our path this Friday will eventually lead us out of town to the north (though signed "west") along I-10, and that's pretty much where the rest of this installment takes us: just off the east side of I-10, a 724-foot tower on Zinnia Street holds the antennas of Spanish-language KCMT (102.1) and Journal's FM talker KQTH (104.1), among the few FMs that aren't up in the hills surrounding Tucson. 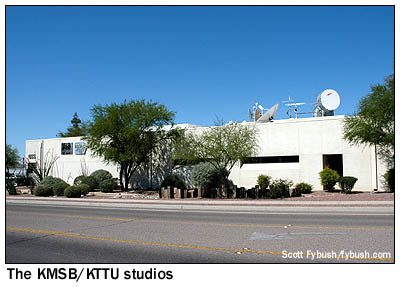 As for the old KFIF on 1550, that signal was donated to the University of Arizona, which turned it into KUAT(AM) as a noncommercial daytimer. 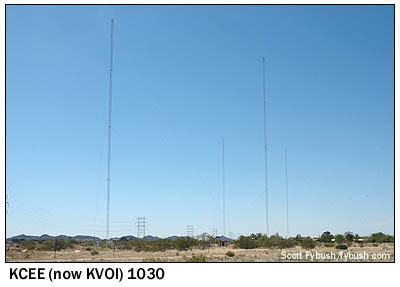 It's now KUAZ, doing news and jazz with a simulcast on KUAZ-FM (89.1), and the AM site sits on the east side of I-10 north of Tucson. 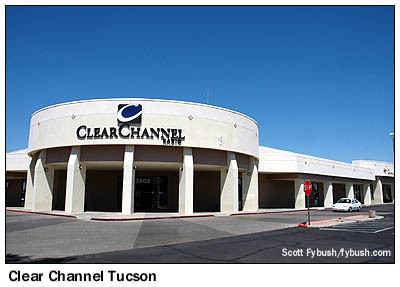 And with all that Tucson tourism packed into about 22 hours, we still missed out on a few sites, most notably the big FM site in the mountains west of town and the TV sites at Mount Lemmon and Mount Bigelow, up to the northeast, but also a few stray AMs and FMs south of town in Sahuarita and Green Valley. We'll have to get back someday to check those out! In the meantime, we're still taking pre-orders for Tower Site Calendar 2011, complete with a KTKT Tucson picture (shipment has been slightly delayed by some production glitches, but we're still expecting to be sending out the first calendars by mid-September) - and we'll have lots of Tucson IDs for you to listen to starting Sept. 8 over at sister site TopHour.com, too!